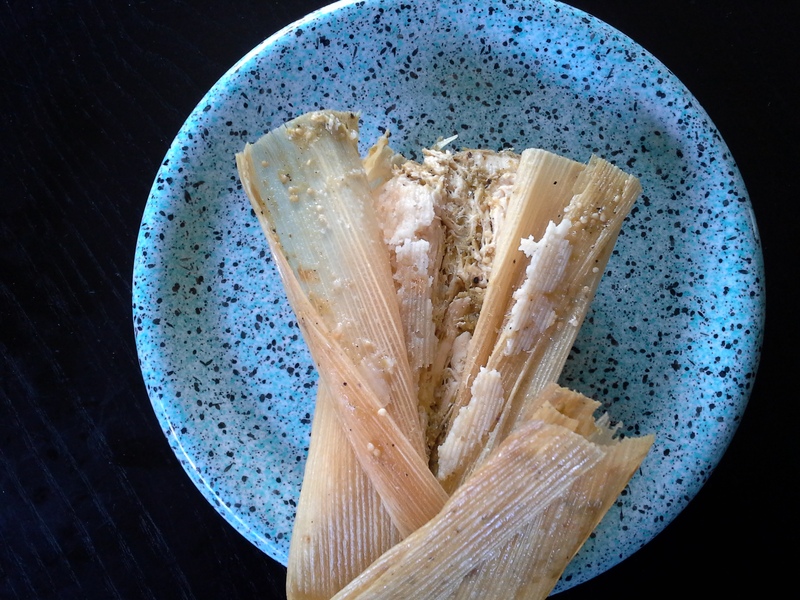 Tamales are a year-round source of pleasure and sustenance in San Diego. Made from masa, a corn-based dough that is steamed or boiled in a corn-husk wrapper and filled with meat, cheese, fruit or vegetables, tamales are often part of San Diego families’ holiday celebrations. While the best tamales in San Diego are those made by a mom or abuela at home, here are some local places to buy these Mexican treats. The Mission Restaurant’s sweet corn tamales breakfast satisfies the soul and stomach. 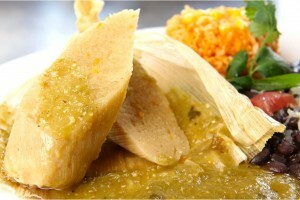 Start off your day right with an order of Plato Verde con Huevos at one of three Mission Restaurants in San Diego. The sweet corn and green chili tamale and eggs over medium covered with roasted tomatillo sauce and served with a side of black beans and salsa offers a sweet and savory combination not to be missed. Pancho Villa Farmers Market chicken tamales burst with filling. I love going to the Pancho Villa Farmers Market grocery store hungry! I do my shopping then sit and have a bite from the Mexican food “deli” section offering freshly made street tacos, birria, and five flavors of tamales. This busy supermarket makes tamales daily with generous portions of cheese, beef, pork, pineapple or chicken filling. The chicken can be a little dry, as these tamales are overstuffed with filling, but my favorite is moist masa stuffed with a hunk of melted cheese and a mild pepper. The line out the door at this old-school joint in Barrio Logan is testament to the authentic Mexican food served within, and particularly to their fresh tortillas made from scratch in front of diners. Las Cuatro Milpas offers solely pork tamales, but they do them right. Moist, with just the right amount of pork stuffing, this place is the go-to restaurant for local families catering their celebrations at home. Just around the corner in Barrio Logan is the shiny new Northgate Market, one of several in a Southern California chain. This supermarket does incredible volume in the prepared food section and offers five flavors of delicious, inexpensive tamales made fresh all day long. The stuffing is not as generous as Pancho Villa’s tamales, but the ratio is pretty darn perfect. The pork filling is a bit too spicy for my family’s taste. Our Northgate favorites are the sweet corn and the cheese and pepper versions. What will they think of next? 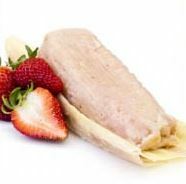 Strawberry tamales from Tamales Ancira in South Bay. Tamales Ancira in Chula Vista offers the widest variety of tamale flavors; tamales are all they serve (along with rice and beans on the side). In addition to traditional beef, pork, chicken, sweet corn, cheese and jalapeño, Tamales Ancira creates picadillo (ground beef with tomato, vegetables and serrano peppers), chicaroon (pork cracklings in a delicious tomatillo sauce), beans and cheese, pecans and raisin, chocolate, strawberry, blueberry and pineapple tamales. Get there before they close or call in your order because tamales are made fresh each day and usually sell out before closing. Of course, some of the best tamales are served from little carts located throughout San Diego County, supplied by cooks crafting the labor-intensive treat at home and selling on the street. Where do you buy your favorite tamales?